In the heart of the Cold War, nuclear weapons were the central issue of international peace and security debates, with a devastating nuclear war considered a realistic possibility. After several decades that saw the rise of threats such as terrorism and transnational organized crime, the nuclear risk is returning to the frontline of considerations, fueled by unstable relations between nuclear-armed states. North Korea’s recent ballistic missile tests and the escalating tensions with the United States serve as an important reminder of the continued threat posed by nuclear weapons to international security, as well as the humanitarian consequences of such attacks. “Studies have shown that the detonation of nuclear weapons would cause widespread death, injury and damage, especially if it occurred in or near a populated area,” and most communities would not necessarily have the capacity to enact appropriate response mechanisms, as discussed in this article by Lou Maresca and Eleanor Mitchell. In parallel with these headline-grabing tensions, the international community at the United Nations headquarters in New York is negotiating a treaty to ban nuclear weapons. While neither the United States nor North Korea – nor any other State that possesses nuclear weapons – are part of the ban treaty negotiations, the timing is very strategic, especially from the perspective of the negotiating States, who are coming together in an effort to advance international security interests, promote nuclear disarmament in good faith, and to protect communities from the humanitarian impact of such weapons. The treaty negotiations began officially the week of 17 March at the UN headquarters, as mandated by the October 2016 General Assembly resolution (.pdf). The second and final round of negotiations will follow in June this year. The March negotiations served as an important platform for negotiating States to exchange their views on the principles and scope of the treaty. Technical discussions will continue in June-July, with informal consultations led by the President of the Conference, Ambassador Elayne Whyte Gómez of Costa Rica, due to take place in the interim. The mandate of the treaty is to “negotiate a legally binding instrument to prohibit nuclear weapons, leading towards their total elimination,” but getting there will be a delicate process, as became evident from the exchange of views in New York. How would the nuclear ban account for previous legal developments? Needless to say, the state of international security and nuclear disarmament has evolved significantly since the mid-1990s. The extent to which negotiating States will account for this change by strengthening the existing legal architecture, is arguably a core question in this process. Take the issue of the legality or illegality of nuclear weapons. There is no express provision under international law that nuclear weapons, their use or threat thereof, are illegal per se. The NPT, the landmark treaty that shapes the legal architecture of nuclear disarmament efforts, prohibits the transfer, acquisition and possession of nuclear weapons by non-nuclear weapon States. It also prohibits the transfer of weapons by nuclear weapon States (which the NPT defined as the United States, Russia, China, France and the United Kingdom). Similarly, under international humanitarian law (IHL), there is no express prohibition for use or threat of use of nuclear weapons. Rather, the use of nuclear weapons is ‘regulated’ in so far as it is prohibited if it is likely to cause civilian casualties or environmental impact. As the International Committee of the Red Cross (ICRC) concluded at its Council of Delegates in 2011, “it is difficult to envisage how any use of nuclear weapons could be compatible with the requirements of international humanitarian law, in particular the rules of distinction, precaution and proportionality.” Under IHL, the rule of distinction “requires the parties to an armed conflict to distinguish at all times between civilians and combatants and between civilian objects and military objectives.” Second, the rule of precautions in attack “requires that in the conduct of military operations, constant care be taken to spare civilians and civilian objects.” Third, the rule of proportionality provides that “if an attack is to proceed, that the concrete and direct military advantage anticipated outweigh the foreseeable incidental impact on civilians.” Finally, the rule on indiscriminate attacks prohibits the use of weapons that is not directed at a specific military objective. As the ban negotiations move forward, it will be interesting to see what weight the ICJ opinion will receive – will it be recognized in a preambular paragraph or be given more legal authority in an operative paragraph, if at all? It should be noted that there have been several regional treaties defining nuclear free zones among regional communities such as those in Latin America, Africa, South Pacific, and Southeast Asia. Treaties that have come since the ICJ decision have not taken a position on the legality of nuclear weapons per se. There are other outstanding issues that would arguably enhance a prohibition treaty on nuclear weapons. For instance, the Comprehensive Test Ban Treaty (CTBT), which bans nuclear testing in the atmosphere due to environmental considerations, was signed in 1996 but has not yet entered into force. What significance will be given to the CTBT? Similarly, given the enduring legal significance of the NPT, how can a new ban treaty build in good faith on the NPT’s gaps? Alternatively, how can the ban treaty be used to further uphold the commitments established by the NPT? For instance, in the event that a nuclear-armed State joins the ban treaty, how would a timeframe for meeting the treaty’s objectives work? What would the verification systems be, if any? Finally, what weight will be given to the humanitarian consequences of nuclear weapons on food, health, environment, agriculture, economy and other aspects of human development? While the ban treaty rose out of the recommendation of the UN Open Ended Working Group on Nuclear Disarmament, those aspects had previously been dealt with in a series of conferences in Austria, Norway and Mexico on the humanitarian consequences of nuclear weapons. Similarly, at the 2010 NPT Review Conference, the Conference “expresse[d] its deep concern at the catastrophic humanitarian consequences of any use of nuclear weapons and reaffirm[ed] the need for all States at all times to comply with applicable international law, including international humanitarian law.” Thus, will these consequences be framed as an overarching theme in a preambular paragraph, or be given more of an operational weight, or both? One would argue that not only does the recognition of those humanitarian consequences act in advancement of IHL, but it may also be one of the easier consensus-building issues, especially if preceding conferences have affirmed such humanitarian fears. What are the limitations of this UN mandate? The aforementioned General Assembly resolution mandated a prohibition treaty that would support the eventual total elimination of nuclear weapons. This is an important distinction with regard to the scope and reach of the ban treaty, because a prohibition treaty can be different from a comprehensive nuclear weapons convention, which has also been the subject of many ongoing discussions. One can argue that a prohibition treaty is less time intensive to negotiate than a comprehensive convention. Similarly, the aforementioned resolution was sponsored by a limited number of States, especially those that are not nuclear weapon States and do not belong to any military alliances, but are generally part of nuclear-weapon-free zones. While the resolution calls on UN member states to participate at-will, it is generally known among those following these discussions that the nuclear weapon States have opted out of the process. Thus, defining the operative paragraphs of the treaty is limited by the goal of the outcome document: is it to get a strong text that might limit the treaty’s universality, or it is to get agreement on basic prohibitions with hopes of getting to universal ratification? What can realistically be achieved in a short time frame and what can be left to be amended at a later time? From this author’s perspective as a mediator, a word on the negotiation process itself is necessary. There are a lot of difficult issues to resolve and complex issues upon which consensus needs to be reached, all within a tight negotiating window. Unlike the Arms Trade Treaty where there were preparatory conferences and a few months had transpired between the two negotiating processes, such tools are not mandated in the current ban treaty negotiations. The March negotiations provided an excellent opportunity for negotiating States to surface the various issues, but much of the preparatory work for the July session will be done via informal consultations. Informal consultations are a great tool for getting an understanding of positions and interests, but unlike plenary sessions, they do not provide an opportunity for parties to explain their positions and exchange in real-time. Nevertheless, a positive outcome can be achieved if negotiating parties stay focused on the mandate of the ban treaty and what its goal is meant to be. While the ban treaty negotiations do not include the participation of nuclear weapon States, and while there are lot of issues that have yet to be resolved, these negotiations provide an opportunity to strengthen the nuclear disarmament framework and to work on filling existing legal gaps. 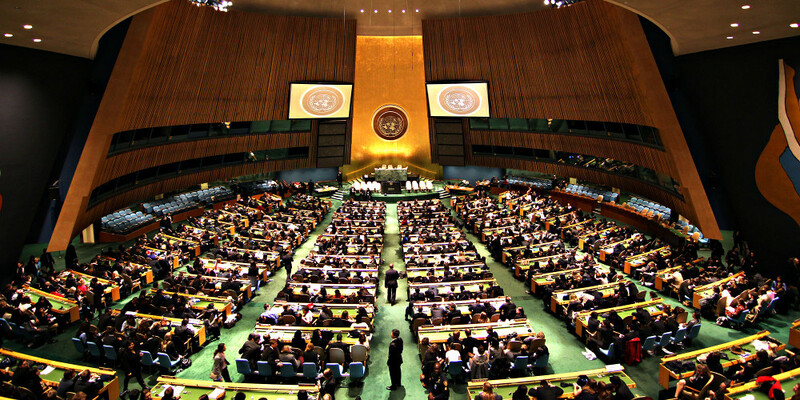 Legally speaking, the possible treaty would be a document bringing together the nuclear disarmament commitment that States parties made in the nuclear-free-zones. Even if that is in itself limited – as it does not involve the nuclear weapon States – it is nevertheless another step toward recognizing the devastating humanitarian impact of nuclear weapons and building momentum toward their full elimination. Melina Lito, Esq is an international law attorney and mediator with experience in international security and human rights issues. She is the founder of a boutique international law advisory and mediation firm advising the UN community on the aforementioned issues. This article is written in an informative capacity and does not constitute legal advice. The ideas expressed in this post are the author’s own. Спасибо буду очень рад этим явлениям ! prof prem raj pushpakaran writes — Let me congratulate UN General Assembly, for the decision to adopt Treaty Banning Nuclear Weapons! !